Scroll down for healthy, delicious Baked Salmon Recipes and other seafood dishes. Seafood is a popular menu selection for many types of diets, and there are countless recipes to choose from. Fresh wild salmon is a healthy, tasty meal that is easy to prepare and ready in fifteen minutes. 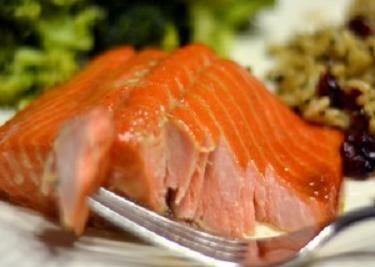 King Salmon, Atlantic Salmon, Sockeye Salmon, Chum Salmon, and Coho Salmon are widely available in the United States and very popular in baked recipes. Other, rarer salmon species include Cherry Salmon, which is found only near Japan, Korea, and Russia. There are many hundreds of delicious Baked Salmon Recipes to choose from. This one is seasoned to perfection. In a medium glass bowl, combine garlic, olive oil, basil, salt, pepper, lemon juice and parsley. Place fillets in aluminum foil, cover with marinade, and seal foil securely. Place sealed salmon in the glass dish, and bake for 40 minutes. This classic, easy-to-make Japanese-style recipe is a popular favorite all over America. If you don't have Mirin, you can substitute a tablespoon of rice vinegar mixed with a dash of sugar. Combine 1/2 cup of Japanese soy sauce (shoyu), and 1 tablespoon of Mirin. Put salmon on the grill for about two minutes on each side. When nearly done, brush the sauce on the salmon generously. Return the salmon to the grill and cook until browned. Cook the other side the same way. Serve with Udon noodles and a salad of baby spinach, tiny tomatoes, and chopped green onions. This dish also goes well with fresh broccolini, pickled ginger, and steamed white rice. For more great salmon dishes and other favorite American recipes, visit any of the links on this page.